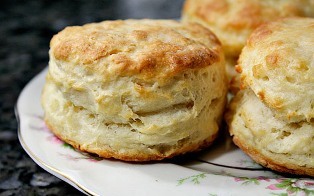 These scrumptious buttermilk biscuit recipe are so easy to make, if you follow a few simple instructions. 12 to 24 hrs before to making biscuits, mix in a bowl the buttermilk and flour together. Cover and let the flour to soak. (But if you are using the sprouted flour then you can skip the soaking part). Preheating the oven to 450°F. Then start by cutting the butter into small chunks and add it to the flour/buttermilk mixture together with baking powder, baking soda and salt. (Remember not to over mix it, but if the mixture is too dry then add some buttermilk). Next is place the the dough onto a lightly floured board. Then softly pat the dough to 1/2 inch thick. (This way the biscuits are lighter then using a rolling pin). Then cut the dough using a round cutter to cut out the biscuits. Place the cut out biscuits into a cookie sheet. Afterwards, bake the biscuits for about 10 to 12 minutes until golden brown.